How are you? Long time no talk. I am finally finishing off the W15 Mini-Monitor. But as they say, last 10% of a job takes up 90% of the time. All I have left now is to finish one last tweeter crossover and I should be done. I have been listening to one complete unit just to hear how it is. I have been very happy with the sound. 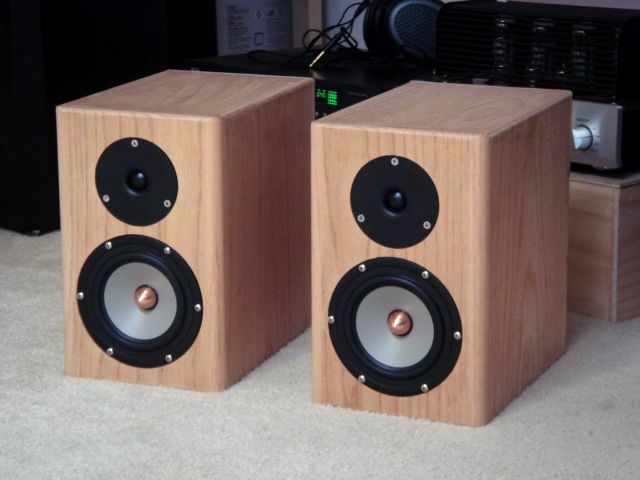 The only other reference I have now is my old B&W 802 series III (L100 is being worked on). Both sound quite different. To me, B&W has a little boomy base, nice and mellow mid and somewhat harsh top end. But over all, the B&W sound is very well balanced and neutral. The Mini-Monitor has more direct and engaging bass/mid and transparent high. Very revealing, and I am assuming it is the nature of the Mini-Monitor. I have re-listened to my favorite recordings and heard a lot of stuff I didn't notice before. When I switch over to B&W, I now hear them. Bass from W15 is much more than I anticipated. 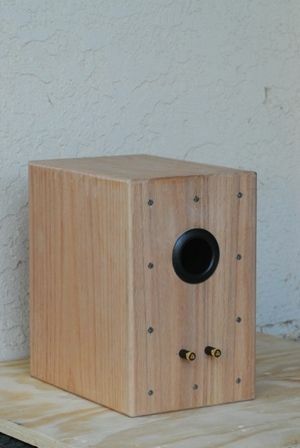 When I ordered Hiquphon from Dave Ellis who sells the OWI tweeters in the US, I talked about my mini-monitor project. He was very much sure I would listen to the W15+OWI more than the B&W. Yesterday I gave both enclosures good sanding job after rounding over the edges. I gave them 1/4" rounding-over on all edges. For front panel sides, I gave them 1/2" rounding-over as you can see in the picture. Looks very nice. Today is Sunday and hope I can finish the tweeter crossover. Thanks for all the help and my next step will be making a proper stands that match the speaker. I will then will be listening to the Mini-Monitor properly and appreciate them even more. 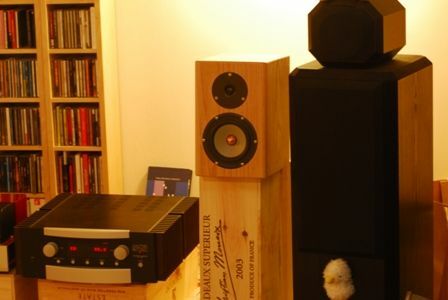 I will send you more pictures once speakers are al done. I had a chance to assemble more pictures from the construction of the mini-monitor. Here is how the construction of mini-monitor went. 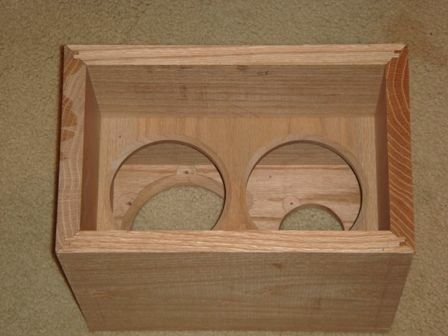 For enclosures, I chose 19mm thick red oak. 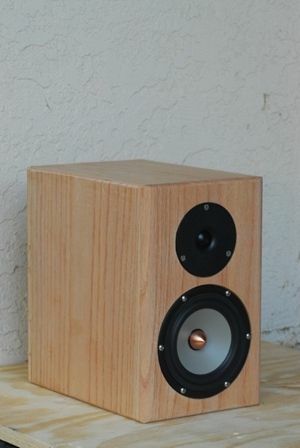 As you have commented, I understood choice of wood was not too critical for a small monitor speakers. As seen above, the circle jig came in very handy when cutting openings for drivers. To be safe, I used a brass screw to secure the baffle to a large panel of a 19mm thick plywood. The center piece was also screwed down. 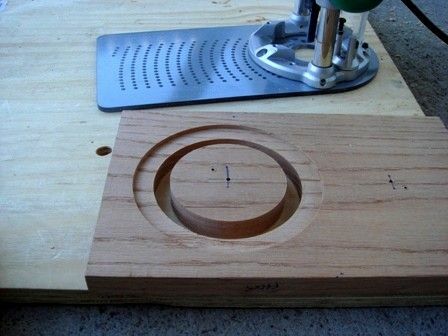 When the router bit punches through the baffle during last go around, the round center piece will not move around. This was my first router and I learned a lot during construction. Even though the red oak was hard enough, I thought adding a bracing wouldn't hurt as long as internal volume doesn't change much. So I used the same 19mm oak and cut out two large circular openings in the middle. Internal edges were chamfered using a 45 deg. router bit. I routed out 10mm wide grooves in the side panels to accommodate the bracing as shown below. Overall depth grew to 265mm. Other dimensions remained the same. I estimated the internal volume to be about 8 liters. I used concealed locking 45 deg. 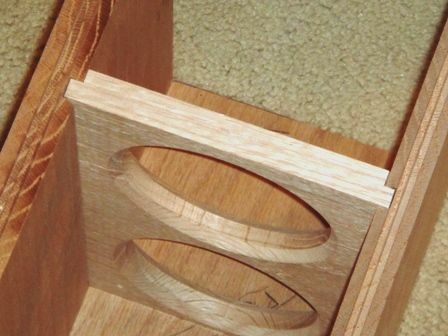 miter joints. It worked out very well and clamping was relatively easy with locking miter joint. I gave the joints 1/4 inch and 1/2 inch rounding over later. I though about keeping the crossover outside the enclosure, but decided to put them inside. There are still some more tasks to do. 1). Glue down all crossover components. 2). Cover the exposed crossover with damping materials. 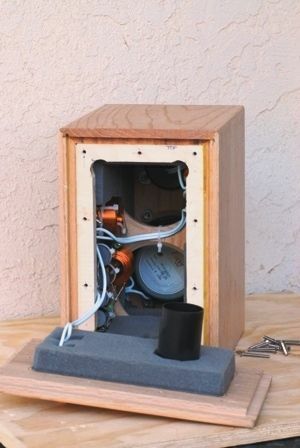 3) Add more damping to the back side of the mid-woofer. It might not be necessary but I want to experiment. 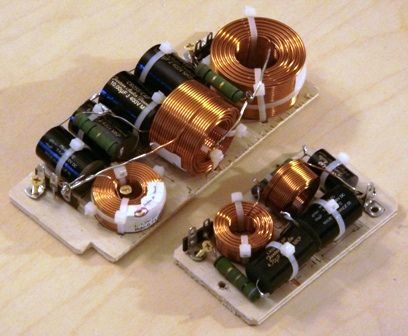 4) Find a way to measure frequency response to be sure. 5) Make proper stands. For now the mini-monitor is happily sitting on top of a wine case next my B&W 802. Thank you very much for such a fun project and I will be enjoying the mini-monitor for a long time. My next project is updating the L100 crossovers using Jantzen kits. When I accumulate enough energy, I will re-start my Zahra project. Hope I can apply the experience learned on the mini-monitor construction. Best regards Young.